How to make oat flour - the simple way! How to make oat flour - the simple way! 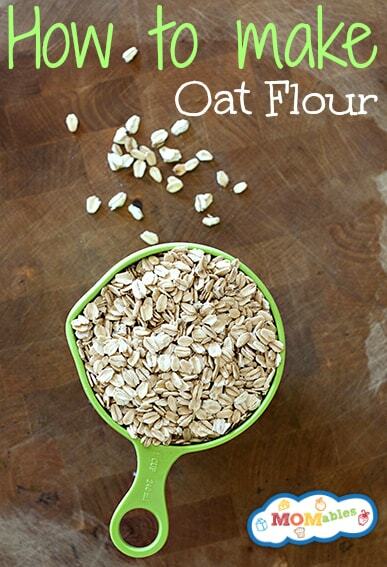 Did you know you can make your own oat flour for pennies on the dollar vs store bought? So many recipes now call for flours much different than the All-Purpose or Whole Wheat that we are used to. Almond flour, rice flour and oat flour have become common among ingredient lists. If these flours are not something you regularly use, it can be pricey to buy a bag that you may only need for a small amount. You don’t have to spend a lot of money because you already have everything you need in your pantry to make your own oat flour, simply and inexpensively. While oats are naturally gluten free, they can be cross contained depending on where they were processed. If you are looking for certified gluten free oat flour, all you need to do is make sure the oats you purchase say “certified gluten free” and then you can make your own gluten-free oat flour at a fraction of the cost. Need a delicious way to put this oat flour to use? Check out the Chief Mom’s Oatmeal Raisin Cookie Dough Bites. They are simple to make (no bake!) and perfect for a treat in the lunch box. Place the oats into the bowl of your food processor. Pulse the oats until they are ground into a powder-like consistency. Depending on the speed and power of your food processor, this process should take 60 seconds or less. Stop and stir to ensure that all the oats have been finely ground. Store unused portion in air tight container. Can I use quick cooking oat instead of rolled oat? Woohoo! Enjoy the apple crumble. Thanks so much for the tip! It took all of 10 seconds to make. Can I make rice flour the same way as making oat flour? And also, is there an article with instructions for coconut flour? I want to make treats for your two dogs that are healthy. Yes, you can make rice flour the same way you make oat flour. There are no “instructions” to coconut flour but it’s not the type of flour that can be substituted 1:1 with regular flour. Coconut flour is the type of ingredient you use following a recipe. I make the oat flour and mix cacao powder and sugar, and then whip it in the Nutribullet for a quick drink with Almond milk, it is sooooo good! In Mexico its already made its called Avena Rivero, but when I can’t go to Mexico I make my own, its that simple. Very healthy drink. That sounds so delicious! Great idea! Just used my Magic Bullet to grind my oat meal in an attempt to have flour…within 15-20 second I had flour, just like the store bought, and for a fraction of what I would have paid at the store! Why did’t I think of this before??? Thank you for posting this suggestion! My life will be so much easier now, and less expensive…..
Can I use steel cut oats to make oat flour (instead of rolled oats)? Yes you can. just make sure they are finely ground. Can I use Oat flour like white flour? I do not like to use white flour because of the processing. not in all recipes Jennifer. For most baking needs. Yes! I use it for cooking muffins, cookies and bread and it comes out fanatastic. I also use baking soda to help with rising it. Great ideas. Thanks. New to gluten-free cooking. I began grinding my oatmeal and love it. I use it in place of flour. I make a stack of pancakes and refrigerate them. I also roll skinless chicken in it and put 2 Tbs. of coconut oil in skillet and fried. Delicious!!!!! I even fried fish in it. Never going back to regular flour. My husband even love it. I ground quick oats to use for flour to make chocolate chip cookies. They spread out completely flat, except for the chips that stayed in the center. After adjusting the cooking time with no success, I stirred in some quick oats (un-ground) to tighten up the dough some, That seemed to help. Any suggestions? Some baking powder maybe? You may need to adjust: sugar, fat, flour, or other ingredients. Somewhere there is a graphic showing which ingredient causes which problem. …too flat, too crunchy and so on. Sorry I couldn’t be more specific at this time. You might want to try adding a bit of corn or potato startch. I am excited to try making my own oat flour. I’m trying (slowly) to get me and my oldest son on a gluten free diet. Could it be because she used quick oats and not just regular oats? Thanks for the simple instructions. I am gluten intolerant. Oat flour is so expensive but great because it is lower in carbohydrates. I am definitely going to try this. Another great way to grind your oats into flour is to use a coffee grinder. I have used mine often to make oat flour. This would not work if you need to make a larger quantity but if you are just using oat flour for one recipe it will work just fine. Can you use a magic bullet for this? If so, which blade? There is a flat one and then one with prongs that stick up in the air. yes you can use your magic bullet. Use the one that chops. I use my magic bullet for this yes. And I use it with the flat blade and it’s flour in just a few seconds. My coffee grinder has one end curved up and the other down, and it just made very nice flour. How long does the oat flour last in a air tight container in the pantry? Can same be accomplished with a blender??? Or is the food processor a must?? You can do this in a blender too. Just give the blender a good shake. Thank you for the great advise, however there is a huge error on your page, oats are absolutely NOT gluten-free. They along with Barley, Rye and Wheat are the main four gluten grains. Other grains include Kamut and Spelt. Please look into this as it could be potentially fatal for a coeliac. Certified gluten free oats DO NOT contain gluten. That is why they say very plainly on the package “certified gluten free”. People with celiac disease can be sensitive to oats even if the oats are certified gluten free. There is a certain protein in oats that can cause the same reaction in patients with celiac disease as gluten does, even if the oats are certified gluten free. The best thing to do is ask the person. If the food item is for a surprise, the prudent thing would be to avoid the oats so you don’t risk causing them undue problems. Cassie, certified GF oats do not contain gluten. They are, however, often cross contaminated in production facilities which is why if someone suffers from celiacs disease they should check the packaging. I make and use oat flour for pancakes and waffles. 2 cups of oat flour, 2 eggs, tsp. baking powder, 1/2 tsp. cinnamon, 1 tsp. vanilla, buttermilk (you can use regular milk as we’ll) the amount of milk is between a pint and pint and a half. If making waffles at a tbsp. of melted butter. Add pecans, walnuts, blueberries or what ever your heart desires. I add ground flaxseed to mine as we’ll. You will never go back to boxed mix again. Almond milk will NOT brown pancake or waffle. Oh, I ground my own oatmeal. If you refrigerate, it will thicken. Just thin with any liquid. Eggnog is great too! I MUST test this out Elaine! thank you! What do you mean almond milk will not brown the pancakes? Love this recipe….added it to my favorites list….thankyou very much…MYO-MI. One cup of rolled oats will yield approximately LESS THAN 1 cup of oat flour. I tried making my own oat flour for the first time. I used an immersion blender on the high setting, which worked quite well for 1/2 cup proportions. I used 1 1/3 cups of quick cooking rolled oats and got 1 1/3 cups of flour minus a little more than 1/2 tablespoon. So for 1 cup of flour, if you want to be precise, I recommend 1 cup of rolled oats plus a rounded teaspoon. how many gram this rounded teaspoon? I used quick cooking oats. Is there a difference? I am also going to store in Freezer.. 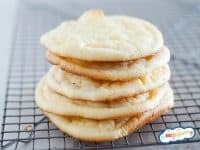 I JUST made some lemon shortbread cookies with quick cooking oats turned into flour using my vitamix and they were DELICIOUS!!! Worked like a charm. The difference between quick cooking oats is that they are typically rolled out thinner and steamed slightly longer in the processing facility as opposed to standard “old fashioned” oats. Same oat so use it as any non quick cooking oat. Love this tip! We make our own almond flour the same way! 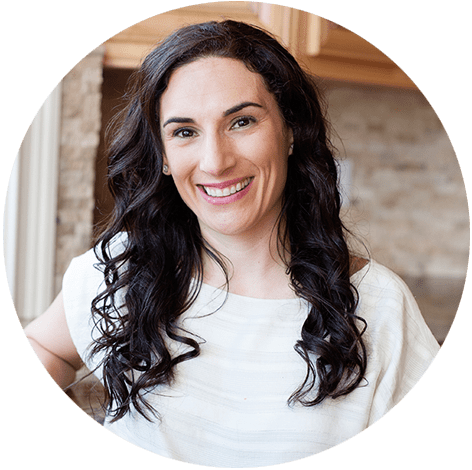 Do you use the ground almonds made into flour the same as you would use flour or oatmeal flour?Thank you so much for this hint at the almond flour is very expensive. Yes, you can finely grind almonds to make into almond meal, although it’s hard for it to have a uniform consistency when ground at home.